Enjoy the best of both worlds - the seclusion of Polar Peak Lodges nestled among the tall pines while the convenience of ski-in accommodation. This mountainside town home is beautifully appointed, and has a well equipped granite kitchen ideal for large families. The town home works extremely well for two families. Parents can enjoy privacy upstairs (3 bedrooms - master has queen bed with ensuite and walk-in; 2nd and 3rd bedrooms have king and double beds respectively, all decorated with True North pine furniture). The entertainment unit on the main floor features a flat screen TV, DVD and stereo. The lower level is great for the kids, with 2 sets of single bunks, a full private bathroom, and separate entertainment area with fireplace. We (Sue and Richard) hail from Southwestern Ontario and Trinidad respectively, and currently make Toronto our home. Our blended family of four children, all in their twenties, are now leaving the nest one by one. We are an eclectic group of avid skiers/snowboarders, swimmers, scuba divers, hikers, sailors, musicians, food and wine lovers! We vacationed in Fernie in 2000, and fell in love with the hometown feel and friendliness of this small and historic mining community which offered the best powder skiing in Canada. Polar Peak is a magical place for us, nestled amongst the pines and firs at the Fernie Alpine Resort. By day it is a great base for the many activities offered in Fernie and the Elk Valley. By night it is engulfed by a wondrous canopy of stars so bright that you realize that the universe has taken extra special care to create this unique and unspoiled mecca. It is a place to re-balance, to pursue the joy of life (and its real priorities! ), and enjoy family and friends. Our favourite outings – apart from fabulous skiing (Oh... what powder!!! ), hiking the Lost Boys Pass along the ridge to Polar Peaks or the trails around Island Lake Lodge, and thereafter enjoying a BBQ with friends. Farther afield, hiking Glacier and Waterton National Parks. 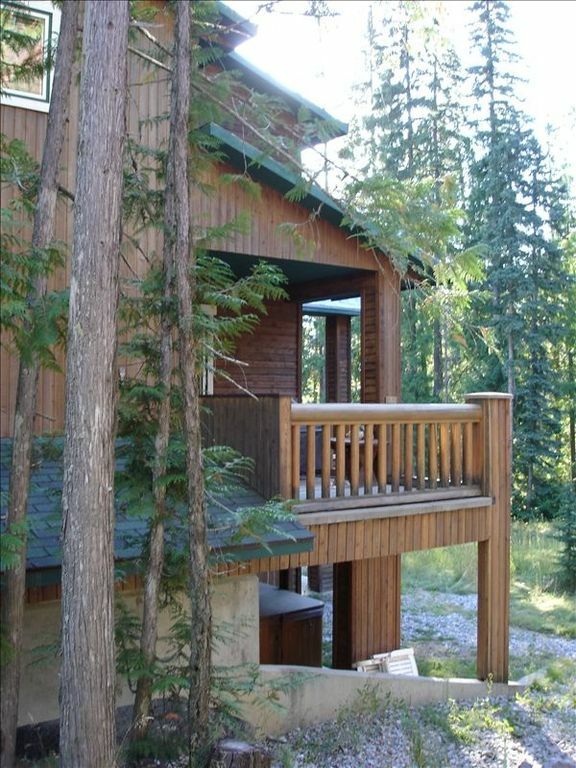 Located 20-25 minutes to Lake Koocanusa, you are close to water sports and boating activities. Our Polar Peak property is nestled at the base of Fernie Alpine Resort with mountain vistas around. We offer ski-in facilities directly to our door and are located within a 6-8 minute walk to the Timber Express chairlift. New slate floor, maple cupboards with granite counters. All stainless steel appliances. After an incredible day of skiing, mountain biking, rafting or hiking, relax away the aches in your own private hot tub or challenge friends to a game of foosball. In the warmer months entertain on the spacious balcony complete with natural gas BBQ. (Note: Damage deposit required). Cooking Utensils Provided: The kitchen is fully equipped and just like home, complete with waffle-maker, blender, mix-master and crock pot. Kid Friendly: This unit is ideal for two families with kids, with games, foosball, and lower level bunk bed and entertainment area. We had a great stay! Everything in the cabin was very clean and organized. The kitchen was well supplied with utensils etc. and the bathrooms were stocked with soap, shampoo and such. Hot tub was wonderful after skiing and we enjoyed the foos ball table as well. Lovely place! A group of 6 of us recently stayed here. The location is great, an easy walk into the village or a two minute drive. Was great to have a garage. There was lots of guest parking available. Beautiful place with an excellent location! First and foremost, thank you Richard and Sue. Your townhouse was the perfect accommodation for our group. Despite having seven people in our party, never once did it feel crowded. The townhouse was a very cozy place for everyone to enjoy. Being able to ski right to the back door made the end of day that much more enjoyable. During our stay we had tons of fresh snow, it was an ideal weekend to visit. After a long day of snowboarding and skiing it was nice to return to a place that felt like home. We prepared delicious meals and cold beverages, all after a long soak in the hot tub to sooth or muscles. I wish we could have stayed longer, thanks again so much for your hospitality. The communication throughout was great, the place was very clean, and it had everything we needed. We will be in touch around the same time next year, it was a blast. Cheers! This was our second, but not our last, trip to Richard and Sue's mountain home. The location was perfect for our two families, as it was a very short walk to the hill with an easy ski out at the end of the day. The home was spacious, with a wonderful room downstairs for the older kids with foosball, tv, bunks and bathroom. Top two floors were perfectly outfitted with a well-equipped kitchen, dining and living areas, three bedrooms , and one powder room and two full bathrooms...plenty of room for us all to be comfortable together yet have enough privacy. The new hot tub was a great treat for all at the end of the day. Richard and Sue could not have been more helpful and welcoming. When we arrived, the hot tub was not working, but Richard arranged to have it fixed within an hour. We felt our comfort was important to them, and we look forward to returning soon. This property exceeded our overall expectations. We all had enough space with the four bedrooms and 3 1/2 baths. The bunk beds were great for the kids! The place was well stocked with all the usual amenities and more. The hot tub was very clean and worked well. We never had any issues at all as everything was clean and organized. I would recommend this location if you ever plan to ski in Fernie! We enjoyed our stay and polar peak 4. Would stay here again for sure! Great Hot tub and BBQ as well. You're very welcome Ian. Please visit us again any time. It's unfortunate that there wasn't more powder during your visit. All the best. Payment: CANADIANS: $US SHOWN ON ALL VRBO/HomeAway SITES EXCEPT homeaway.ca PST, MRDT & GST tax (15%) will be added to all rates above. Cleaning charges will apply. Note: A separate Rental Agreement will be sent to you for your signature that covers the terms of the rental property.